…thankfully fell elsewhere for most of this year's King's Voices tour to Barcelona; glorious sunshine instead beamed down on us for the majority of our time in the city. I was staying in Hostel New York, a simple but mostly functional youth hostel, situated on a narrow street two blocks from the sea and close to the infamous boulevard, La Rambla. The location provided a good base from which to explore the cultural delights of the Catalonian capital, home of crazy architecture and lively nightlife. Barcelona cathedral is a magnificent building, although the grandeur is not immediately visible from the outside. The fight for space in the city centre has resulted in the huge building slotting neatly into a maze of narrow surrounding streets, like the last key piece in a gigantic jigsaw puzzle. If anything though, this makes the cavernous inside rather more astonishing; the high vaulted ceiling seems to contain a space far bigger than could be imagined possible from the exterior. The building is supported on thick pillars, between two of which a large organ is suspended in a seemingly precarious manner. Numerous side-chapels dedicated to various saints line the nave, their opulence varying considerably, presumably as a direct consequence of the wealth of the benefactor who paid for their construction. The impressive impact is rather diminished however by the buzz of a horde of tourists reverberating through the space. The numerous flat panel screens and LED prayer candles also provide a curious juxtaposition with the dignified traditionalism of the place. The scarcity of pews in the nave of the cathedral hint at the different masters it perhaps now serves: the tourist with a point-and-shoot. The midday mass for which King's Voices were singing happened in a chamber at the rear end of the cathedral. With no choir stalls we rather uncomfortably stood to one side throughout the service. However, it was mercifully short and we thankfully managed to correctly interpret the nods from the priest indicating when we were to start the next number. There are three names that appear to occur in any art-related trip in Spain: Dali, Gaudi and Picasso. The Sagrada Familia is the most famous Gaudi building, its fairytale-esque spires immediately visible from any surrounding vantage point in the city. Having toured it on a previous occasion though, I took the opportunity of this visit to climb up to Park Guell, designed by Gaudi for a luxury housing development at the beginning of the twentieth century and now open to all. 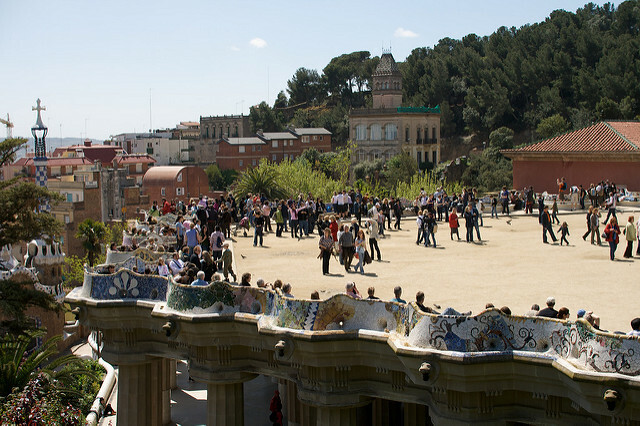 It is an elegant park set into a hill, with Gaudi's characteristic curved lines and elaborate detail. The shady green space provided a great spot to relax and have a picnic lunch under the warm midday sun. The Dali museum in Barcelona is not one of the major ones in Spain. The paintings, photographs and sculptures on display are perhaps not his best, but are different to many of the more commonly seen works and there are a few brilliant items by the prolific artist; I felt the painting of the Trojan army swarming out of the wooden horse perfectly captured this exciting moment, with the economy of lines, shapes and colours distilling the essence of the dramatic scene. A large and very appreciative audience came to enjoy our concert in a church to the north of Barcelona. A rich acoustic somewhat reminiscent of King's Chapel added extra depth to the programme of traditional English choral music, which included works by Byrd and Purcell and finished with a magnificent 11-part Kyrie from a mass by Francisco Valls, once organist of Barcelona Cathedral. 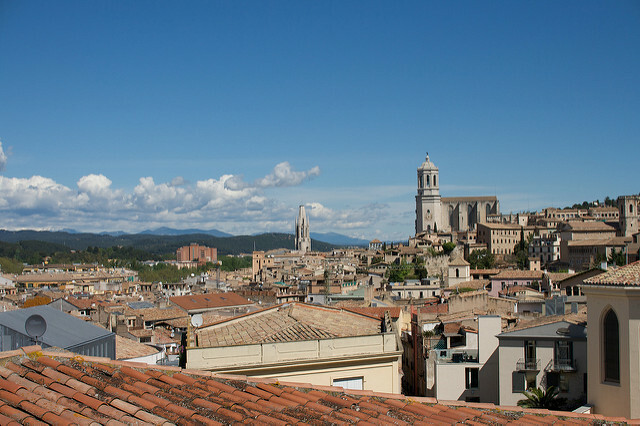 The last full day of the tour was spent in Girona, an hour and a half's bus ride away towards the French border. We were the guests of the choir of Universitat de Girona, who gave us a guided tour of the magnificent walled town before the concert. Afterwards they joined us for a lovely dinner of local meats, cheeses and bread before starting off some joint dancing and singing. 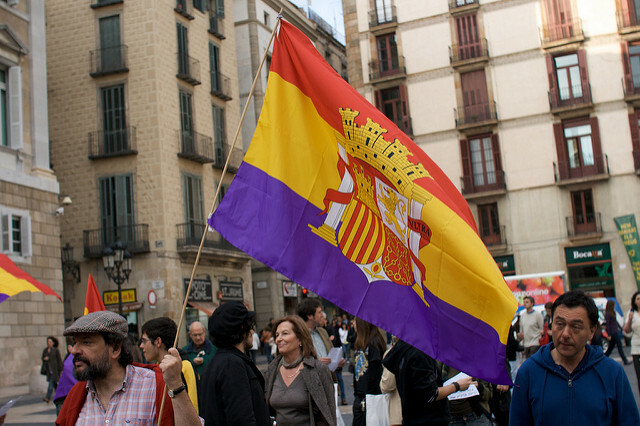 Good food, a relaxed attitude and a sense of fun; I think they really captured the spirit of Spain.